This is an infuriating book. This is also a hopeful book. How the author manages this alchemy of outrage and uplift requires close attention and willingness to learn. Ms. Juhasz names names and doesn’t pull her punches. She has done her homework, filled in the gaps. She argues her case like a lawyer, and I'm glad she's on our side. I’d divide her book into four parts: Vision, Methodology, Rebuttal, and Revision. 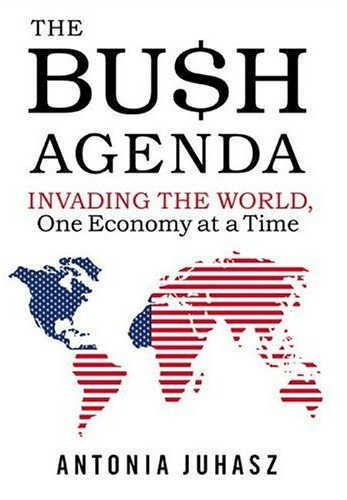 Bush’s vision is abetted “through the barrel of a gun.” The major corporate players are Halliburton, Bechtel (the world’s largest construction company), Lockheed Martin (the world’s largest weapons manufacturer), and Chevron (one of the “Four Sisters” oil companies). These corporations thrive on the control and exploitation of energy -- namely, oil production and distribution, and they have spearheaded America’s imperialist thrust into the “developing” world. Integrated boards of directors, seats on “development” agencies like the World Bank, IMF, and WTO, and revolving-door blurring of public and private sectors -- all serve to promote their mutual interests. Chevron, for example, is “the only oil company in the world that can count the former U.S. national security adviser and current secretary of state as a former director.” That’s Condoleezza, of course, proud bearer of the name of a Chevron oil tanker! Then there’s Bechtel, where George Shultz, Reagan’s Secretary of State, has been pasturing for decades. The point is, they all know each other. They go to the same parties! Add the NeoCon media and think-tank hucksters -- William Kristol, James Woolsey, Kenneth Edelman, Robert Zoellick, Lynne Cheney (the V.P.’s wife served on Lockheed Martin’s board from 1994 to 2000), and, of course, Henry Kissinger, et. al. -- salivating in print and broadcast venues since the end of the Cold War, about the need to establish a global Pax Americana and we’ve all the ingredients for a Superpower empire. Then, light the fuse with 9/11 and Iraq! Juhasz devotes more than half her book to the “mutual seduction” of Iraq. She describes how, “over the course of several administrations,” the four corporations used their influence “to increase economic engagement with Iraq and then, when Saddam Hussein no longer played ball, to advocate for war.” Bechtel, Chevron, Halliburton, and Lockheed Martin “were part of a chorus of corporations desiring increased and more secure access to Iraqi profits.” Clearly, our corporate-governmental alliance used 9/11 and then the myth of WMD to declare illegal war -- in violation of the Geneva Conventions, which our Constitution upholds as a treaty obligation, “the law of the land” -- to seize the oil wealth of 25 million people and establish new military bases in the Middle East. How Provisional Authority “Dictator” Paul Bremer spent 14 months in Iraq issuing 100 Orders that lock Iraq into deleterious “free-market,” judicial and military agreements, should comprise a book in itself (but not one written by Bremer!). One of the principal architects of that plan was Paul Bremer, who left the U.S. State Department in 1989 to become the managing director of Kissinger Associates. Bremer was no naïf in suit and combat boots, struggling to bring order to a devastated Iraq. He was following a carefully scripted plan, devised by the corporate and government elite for over a decade. He knew exactly what he was doing. In 2001, he had warned companies that “the painful consequences of globalization are felt long before its benefits are clear.” The point is, the War on Iraq, and the “War on Terror” have never really been about spreading democracy or freedom, or finding weapons of mass destruction or toppling a dictator. They have always been about globalization -- and war as the chief instrument to spread the American brand of it. Bremer’s 100 Orders are akin to Presidential Executive Orders. It doesn’t matter what sort of Constitutional government Iraq may evolve into, Iraqis are hidebound by the Orders they were given. Order #62 enabled Bremer to determine which Iraqis could run for or hold public offices. Order # 65 established an Iraqi Communications and Media Commission, and Bremer appointed its members. Order #’s 57 and 77 placed American representatives in key decision-making positions within each government ministry for terms that last five years -- well after the permanent elected government of Iraq takes office in 2006. What we have here is not freedom, but the perversion of freedom. Not well-meaning Americans spreading the ideals of democracy, but the worst kind of hypocrites. Do we still wonder why these people hate us? Do we wonder why the “insurgency” goes on and on and on when we lock our clients, our colonies, into alien systems, forcing them to bow before our alien gods of commerce and our martial law? Juhasz describes the tragedy of imperial over-reach, but she concludes with a ray of hope and a call to arms: the interlocked arms of citizens, consumers, students, working people, mothers -- all those who stand for community against empire, localization against corporate hierarchialism, human values against profits. She was Congressman John Conyer’s aide, and she has served as the project director of the International Forum on Globalization. She has marched and protested, appeared on CBS News, CNN and NPR. She’s been there and she’s done that, and in this fine, thoughtful book, she tells it like it is, and, if we awake in time, like it still could be. Gary Corseri has taught in public schools and prisons in the U.S., and at US and Japanese universities. His work has appeared at Dissident Voice, Palestine Chronicle, TeleSurtv.net, CounterPunch, CommonDreams, The New York Times, Village Voice, Uruknet, City Lights Review, Atlanta-PBS, WorldProutAssembly and 200 other websites and publications. His books include: Manifestations (edited); Holy Grail, Holy Grail; and A Fine Excess. He can be contacted at: corseri@verizon.net. * Too Many Mexican Poets! * Whose Freedom Do We Mean? * Anagrams for the Disemployed! * Ronald Reagan Kicked Out of Hell!